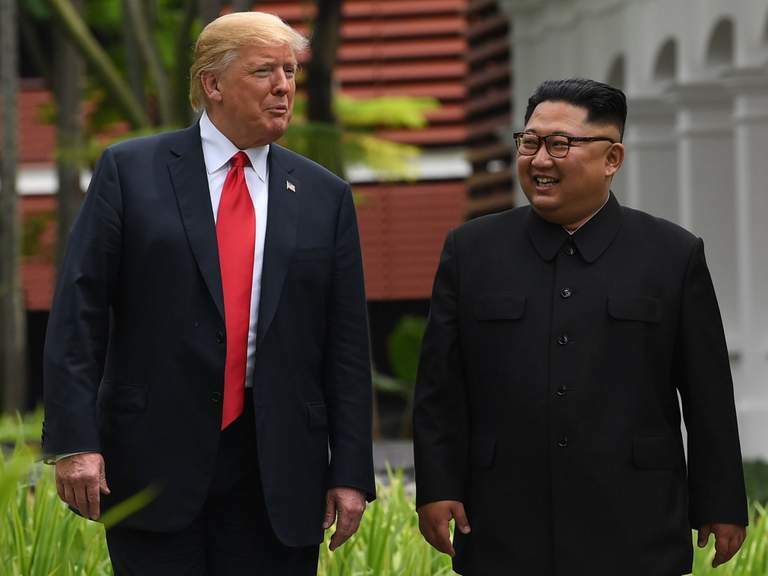 US President Donald Trump (left) and DPRK Chairman Kim Jong-un (right) in Singapore. It has been easy for some even in the US Government to muse over the intentions, concepts, policies, ideals and even personality traits of the leadership DPRK, and then enumerate reasons why the denuclearization process would likely fail. What is more difficult is to gather all information available and put good minds to work at developing ways to cope defeat those problems in order to achieve the President’s goals. Trump is working hard to make denuclearization a reality. Hopefully, Kim is working hard in Pyongyang to do the same. 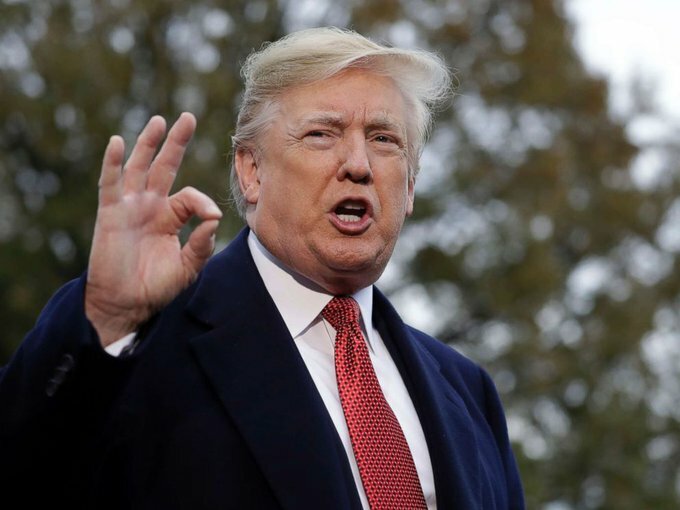 Regarding the Democratic People’s Republic of Korea (DPRK) and denuclearization, US President Donald Trump has pursued what he perceives to be an opportunity for the US to change things for the better. Since his meeting with DPRK Chairman Kim Jong-un, Trump has expressed the view that relations between the US and DPRK are the best that they have ever been. He explains that is evinced by the fact that: his communication with Kim has been very positive; there has been no nuclear weapons or missile testing; US citizens being held in the DPRK have been returned; and, the US is receiving remains of its soldiers lost in the Korean War. It has been easy for some even in the US Government to muse over the intentions, concepts, policies, ideals and even personality traits of the leadership DPRK, and then enumerate reasons why the denuclearization process would likely fail. What is more difficult is to gather all information available and put good minds to work at developing ways to cope with or even defeat those problems. That is what the Trump is trying to do. Hopefully, Kim is working hard in Pyongyang to do the same. Now is the time to advance toward the actual realization of denuclearization as well as have the US enumerate what it and the rest of the world will actually do for the DPRK. Kim seated during his 2019 New Year’s Address (above). It is very likely that both Trump and Kim will find in that face-to-face encounter that they are respectively not the exactly same as on June 12, 2018. Much as Trump has expected Kim to have evolved somewhat in terms of his thinking on the US and on the potential of his country following their Singapore Meeting, Trump, having gone through much concerning international affairs, has surely evolved since. Trump and Kim have already shared their elaborations of how the other troubled them in Singapore. The connaissance suffisante that they acquired of one another then has served as the basis upon which continued communications between them was comfortably founded. That communication was mainly conducted by using their top officials as envoys and letters. What they truly understand about each other, their chemistry, will be verified by the results their next meeting. It is very likely that they will find in their next face-to-face encounter that they are respectively not the exactly same as in Singapore. Trump already seems to feel Kim has evolved in terms of his thinking on the US and on the possibility of transforming his country. Kim will discover that Trump, having gone through much in the realm of international affairs since, has also evolved. Objective observers of Trump would say that if one is able to get a sense of Trump’s inner thinking, one would become better able to parse out or simply have better sense of his decisions on foreign and national security policy. Otherwise, he may often appear to be doing nothing when he is actual doing a plethora of things, step by step. In his efforts, Trump does not act as if he were tinkering figurative tools in his political maneuverings and deal making. Rather, he uses certain “instruments” to methodically, and rapidly, tailor a situation, to craft things. The vocal “bang and boom” often heard while he takes action is typically used as distraction and even amusement at times. Within, he approaches matters with a rhythm that is smooth and unbroken, steady and strong. He always has a plan and knows where he is going. His true target is not always one that others would immediately discern. He prefers to accomplish many things at once. When warned about advancing on a matter, Trump may often boldly push ahead. In his current position, much as during business life, Trump will treat important what he intuits on how to proceed. US Government foreign and national security policy professionals may appreciate his ideas, but requirements that they much adhere to regarding diligence will invariably demand that generally refrain including his “gut reactions” in their analyses. Yet this contrast in approach in no way serves as indicia that the relationship between Trump and the US intelligence community has been corrupted. On that basis, an understanding of Trump’s approach to foreign and national security policy can also be founded. A fairly common belief globally, but not always admitted in more recent times, is that the US is the beacon and the ballast for the world. Trump holds to that belief, and knows that it would be a moral failing to be remiss or delinquent in dealing with urgent and important issues However, unlike his predecessors, while he sees all the needs around the world, Trump is not inclined to hand anything to anyone. He would like the other party to demonstrate, through some exchange, of goodwill even, an appreciation for what the US may give. Me rendez-vous heureux? Once Trump has determined what he desires from a matter, he finds a path to get where he wants to be, regardless of how rocky. With the knowledge of how he can successfully proceed firmly in mind, Trump often will initially be patient, allowing an opposite party to try to better understand and find some agreement with his positions. The value of that would be to facilitate any negotiations. Intriguingly, Trump prefers and usually seeks to reach a mutually acceptable agreement through negotiations. Yet, at the same time, Trump will allow the path he charted to develop further. If a deal cannot be reached, he will travel that path to his goal. Interestingly, his clashes with political opponents have underlined that “they do not get Trump.” They seem to have no desire to examine him in an objective way. Kim should avoid the mistakes they have made in negotiating with him. Most important to know is that what Trump does on one issue may serve to positively shape what he is doing on another. He economically exerts his energy, squeezing the maximum benefit from his decisions. Persistent, iniquitous, coverage of Trump’s handling of the very important political debate on border protection, the border wall, the government shutdown and even the State of the Union Address, obscured the reality that there were other important and urgent matters on his plate. A sampling of what Trump was working on at the same time included: agreeing to a new meeting with Kim on denuclearization, throwing full US support behind the interim president of Venezuela, Juan Guaido, drawing down US troops from Syria, watching peace talks and the US drawdown in Afghanistan, and working in trade with China. National unity and expressions of goodwill in the US were necessary for the world to see, not a partisan battle. By the way, the outcome of that partisan battle on border security, even though it may not be generally accepted, is certainly assured to go Trump’s way. 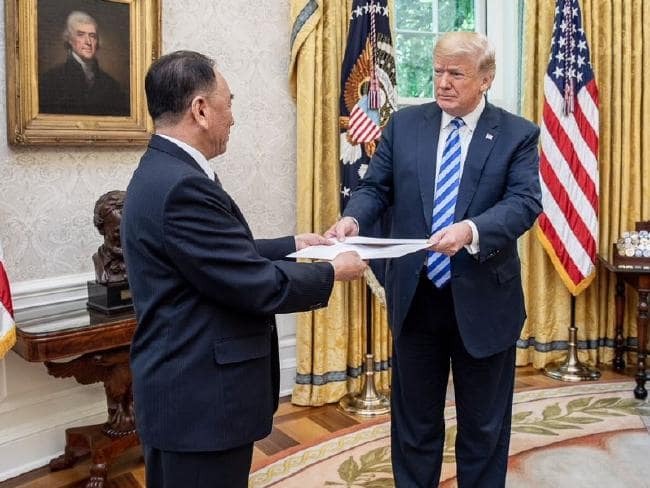 The Vice Chairman of the Workers’ Party of Korea, Kim Yong-chol (left) hands Trump (right) a letter from Kim. Trump and Kim have already shared their elaborations of how the other troubled them in Singapore. The comfortable level of connaissance suffisante they acquired of one another has served as the basis upon which continued communications between them was founded. That communication was mainly conducted by using their top officials as envoys and letters. What they truly understand about each other will be verified by the results their next meeting. The initial meeting in Singapore allowed Trump and Kim to get a sense for one another, discuss expectations, and essentially figure out whether denuclearization was even feasible with all things considered. In the second meeting, some tangible steps toward denuclearization must result or the entire process will be largely seen as a failure. If a memorandum of understanding, outlining requirements, responsibilities, and time lines for action to which officials from both sides could later add flesh out, that would be very encouraging. If Kim came to the meeting and then left having offered nothing new, he would make a huge mistake. If Trump feels in the end that he has been led down the garden path on denuclearization, and would be left standing before the world with nothing, he would not react well at all. Given the militaristic culture and security mindset that undergirds the DPRK’s society, Kim naturally may still harbor fears over being outmaneuvered by the US in a way that leads to military invasion. A new window of opportunity has been opened for US-DPRK relations and for the DPRK directly, and the world. Still, due to that, one must not treat the fact that after July 27, 1953 armistice ending a horrific three year war on the Korean Peninsula, tens of thousands of troops on both sides of a Demilitarized Zone remained heavily armed and on alert in a stand-off with less care than it deserves. The 65 years following the war were a time of anger, aggression, deception and betrayal between the US and the DPRK. What emerged from that period within both governments was a vast paranoia. That paranoia eventually hardened, became somewhat ordinary, and seemingly gave rise to intractable negative beliefs and harsh convictions of both nations respective intentions. This defacto bigotry in thinking on both sides colored personal and institutional perceptions, doubtlessly insinuating itself into studies, observations, and varied other reports on both sides. This was particularly so in the military and intelligence and other security services. Having for years regularly diagnosed one another as bad, to be fair, it is now hard for them to turn on a dime because one wants them to do so. Great unease, suspicion would naturally exist. Having kept the DPRK in isolation, much as his father, Kim Jong-un, and his grandfather, Kim Il-sung had for so long before him, Kim might certainly concern himself with having his society become rapidly “contaminated” by stealthy Western efforts to influence his people or simply by philosophies and lifestyles that loyal members of the Workers’ Party of Korea would consider anathema. With this alone in mind, it would be unreasonable for anyone to complain that a change in the mindset of the DPRK on interacting so closely with the West on denuclearization or any transformative matter should have come more rapidly. Trump did not leave Singapore feeling a need to dictate the tempo of the negatiation process. It has been left to Kim to guide his country across the many figurative intellectual and emotional pickets lines that exist to denuclearization. However, what could be legitimately characterized as a resistance and reluctance by Kim to advance toward an agreement may indicate that he may fear an invasion of another sort. He may fear that economic development effort will lead to invasion in the form of multinational corporations which are accountable to no one. Multinational corporations would argue well that they are good global citizens doing much that is not publicized. A general impression in many capitals, however, is that help from them is not really help. They are viewed as operating solely with pecuniary interest in a country. One only needs to recall the experience of Russia following the fall of the Soviet Union a Russian Federation President Vladimir Putin regularly laments. Undoubtedly, Moscow has reminded Kim of that. The massive multinational corporations have budgets greater than the DPRK itself. They are well staffed by very intelligent and capable development professionals who diligently look for what to exploit in weak countries. They can engage in nearly formulaic efforts to self-enrich themselves leading to dreadful damage to societies even if it is unintentional. It can become a plundering of countries struggling to pick themselves up and trying to organize themselves. Kim may believe that opening the DPRK to assistance on economic development may make his country vulnerable to corporate intrusion as it tries to emerge. It is unlikely that the idea of creating linkages between US based multinational corporations and DPRK industries to foster their development, as was done in South Korea many decades ago, will not fly in Pyongyang. The DPRK will most likely want to move along its way without corporate intrusion. If Kim expresses such a concern in the next meeting, Trump will likely guarantee that he would not even hint to any multinational corporation that some right or protection will be provided to seize DPRK resources. If in the aftermath of the Trump administration, multinationals attempt the move in on the DPRK in well-worn, predictable ways, that will almost guarantee an ugly response in which the multinationals will be most likely be violently forced from the scene. Ultimately, that might lead to the collapse of everything positive achieved. It is highly recommended that Trump should have a solution available to address that likely concern to share with Kim at the negotiation table. Among the advantages that would supposedly be created by the DPRK’s cooperation with Trump, would be the betterment in the standard of living and ostensibly, through an improved economy, the empowerment of the Workers’ Party of Korea which itself would presumably go through some change. Through its transformation, the DPRK would no longer be “The hermit kingdom”, but rather, find itself invited to the grand table of countries. It too would be able to wield real influence internationally; it, too, would be involved in decisions made on urgent and important matters. Yet, regarding economic development, Kim may reason that the same economic levers that Trump may use to ratchet up the DPRK’s economy and greater industrialization can be used conversely to supplant his government’s freedom of action. It may even be used to undermine Kim’s present unrestricted, authoritarian control his country. If a reliance on the help of the US, or the international community in some collective effort, to subsidise the DPRK’s organization were to develop, the US and others would be able to control the spigot from with the society’s revitalization flows. Kim will be fully responsible for that circumstance, that loss of independence, self-determination, and control. Realistically, the long-term process of the DPRK’s economic development will go beyond his time in office and the mission of transforming the DPRK would be assigned to future US administrations. Trump should consider Kim’s possible concern that while he has an exceptionally good relationship with him, perchance, relations between himself and another US President soon to follow may be problematic. If that turned out to be the case, rash behavior might once again be seen from Kim. Indeed, the need to break any perceived “chains” of Western economic and financial subjugation, and the need to regain full control of its destiny, may impel the most aggressive responses possible by Pyongyang. A mechanism must established to make sure that the US-DPRK relationship will continue to be handled with empathy and nuance. 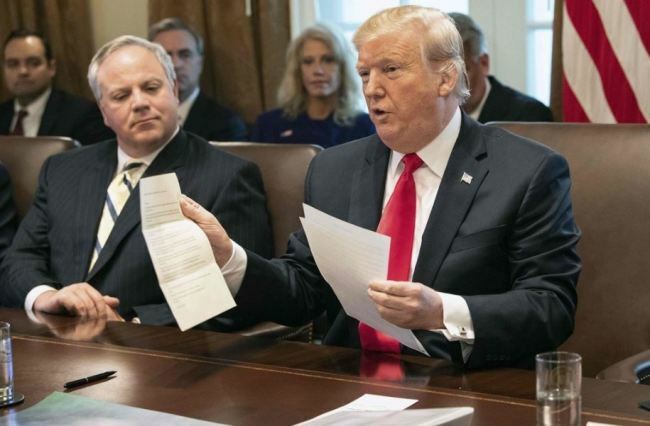 Trump displays letter from Kim Jong-un in Cabinet Room of the White House (above). Beyond their communications, Trump might reassure Kim by presenting him with a discussion of concrete, enumerated steps that would be taken to economically energize the DPRK in exchange for denuclearization. A new DPRK, economically viable enough to find a place at the table with other successful economies in the region, may all sound well as part of a prospective process. Nevertheless, Kim, if his intentions are positive, will want to know how it all would actually pan out for him in the real world. 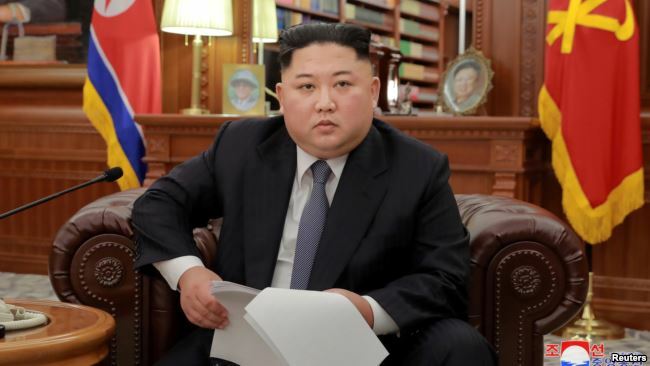 Conceivably, more so than less, Kim feels that he can rely on what he might call Trump’s “humanism.” Still, reassurance, most important in negotiations between adversaries, cannot come simply from engaging in more talk with Trump. Trump has already expressed much to exhort Kim to move toward denuclearization. Kim knows very well that Trump now wants to see genuine steps that will complete the dismantling and elimination of the DPRK’s nuclear weapons program. Assuredly, Trump will not present a partial version of himself through which he would intend to deceive Kim. There would not be some sort of “secret world” stuff going on that might possibly be discovered in his words, mannerisms, and attitude. Beyond ongoing communications, Trump might reassure Kim by presenting him with a discussion of concrete, enumerated steps that would be taken to economically energize the DPRK in exchange for denuclearization. A new DPRK, economically viable enough to find a place at the table with other successful economies in the region may all sound well as part of an imaginative prospective process. Nevertheless, Kim will still want to know, if his own intentions are positive, how it all would actually pan out for him in the real world. Trump must bring tangibles to the negotiation table during the second meeting developed from his own shrewd thinking and knowledge of resources that he can commit to a deal. When mulling over what to present to Kim that would serve as the making of a plan of action, Trump’s aides and advisers likely determined what the relative value of a tangible might be to the other side. It must be useful enough to create some sense of equity, balance, and perhaps if a side is lucky, it might represent some real gain. Many of Trump’s suggestions might be steps that Kim and his aides and advisers in Pyongyang never considered. Despite what may be the wish of Pyongyang, no suggestions that may shift the security framework that exists between the US and its allies in Northeast Asia should be brought to the table with reasonable hope of seeing change. Indeed, Trump certainly must not give up the strengths and equities of its alliances with allies. Although the DPRK would the focus of talks, those ties that bind allies in the region are the same ties that assure unity when dealing with China. Indeed, given the concerns of the US and its allies to China’s actions and intentions in the Asia Pacific region, a reaffirmation of cooperation and commitments on security among them should be expected. Overall, Kim can rest assured that Trump will not offer rotten apples for him to choose from. Simulatio delet veritatem, sine qua nomen amicitiae valere non potest. (Pretense obliterates the truth, without which the name of friendship cannot survive.) Kim would do well to focus on his own country’s relations with the US as well as neighbors in the region. If he is negotiating with some pretence of serving certain interests of China at the same time, he will essentially throw away an opportunity as the US and its regional allies would surely detect that effort. Kim must no longer allow his country to remain a prisoner of what most in the world views as an ignoble momentum. Speculating on what might be offered, there might be some type of Marshall Plan tabled by Trump. Development programs similar to the Korean Peninsula Energy Development Organization must be organized for the DPRK’s many industries. Using its own wisdom, and the external assistance it chooses to receive, the DPRK must in a more efficient way enrich itself with its own natural resources. Improved trade opportunities with other countries worldwide, facilitated by guarantees by the US, could be established following the removal. Rather than to multinational, linkages could be made to the economics departments and business school of specified US colleges and universities. There may be some small-scale variante of the Peace Corps with well-defined parameters encompassing state-run industries and other economic activity within the DPRK, narrow in scope, curated in a way that recognizes the extraordinary internal security concerns of the DPRK. Those concerns will not go away overnight. Trump is certainly not a political hack being led from the nose by his political party, not a creature of some financial interest due to subsidization, and not a corporate pawn as his enemies portend. or as a number of other US political leaders reportedly have been alleged to be. The potential threat that he could be lobbied or coerced to acquiesce to demands from some external source, political, financial, or corporate, is nonexistent. Nothing of that sort could possibly undermine what might be achieved. Trump feels unfettered by what was not accomplished in the past, or what has been called impossible. He has the vision and spirit to achieve news things. In this case, it is denuclearization and the DPRK. He knows how to support its industrial development, and usher it to a positive place in the international order. What drives Trump to get this deal is not his purported tendencies toward social ambition and aggressiveness. This is actually Trump putting his best foot forward. Although the values and interests of the US will be satisfied, it is predominantly about doing what is right for both the people of the US and the DPRK as well. In Act 1 scene 3 of William Shakespeare’s play The Taming of the Shrew, a story in the story of tinker abused as part of a local lord’s practical joke upon a poor tinker, Christopher Sly. He is convinced that he is a lord, and troupe of actors performs a play before him which makes up the main story of The Taming of the Shrew. Their play takes place in Italian city of Padua, a rich young man named Lucentio there to attend university, instantly falls in love with Bianca, a beautiful, mild young woman. However she already has two suitors, Hortensio and Gremio, and Bianca’s father has declared that no one may court Bianca until first her older sister, Katherine, an ill-tempered is married. That problem is ostensibly resolved when Hortensio’s friend Petruchio, a audacious young man from Verona, arrives in Padua seeking a wealthy woman to marry. Believing he has found what he was looking for, he agrees to marry Katherine sight unseen. Several characters add to the warnings Petruchio hears about her. However, rather than back away, he views marrying her as a challenge, not just a money making opportunity. He explains that living with Katherine could not possibly be worse than the hardships he endured in war and at sea. Petruchio exhorts: “Think you a little din can daunt mine ears? / Have I not in my time heard lions roar? / Have I not heard the sea puff’d up with winds / Rage like an angry boar chafed with sweat? / Have I not heard great ordnance in the field, / And heaven’s artillery thunder in the skies? / Have I not in a pitched battle heard / Loud ‘larums, neighing steeds, and trumpets’ clang?” In the same vein as young Petruchio, Trump feels unfettered by what was not accomplished in the past, or what has been called impossible. (By the way Shakespeare’s Petruchio proved his capabilities and eventually became happily married to Katherine.) the vision and spirit to achieve news things. In this case, it is denuclearization and the DPRK. He knows how to support its industrial development, and usher it to a positive place in the international order.